Should I get my back scanned? Imaging (XRay, CT and MRI) is not generally indicated in people who are suffering back pain. In fact, people should only be referred for scans if there is a severe, progressive neurological deficit or signs and symptoms that indicate a serious underlying condition may be present. The body of scientific evidence tells us that routine imaging for low back pain does not add any clinical benefit and can actually lead to worse outcomes for the patient (see here). However, if you already have a scan of your back, your physiotherapist can use it to interpret any clinically relevant findings. Imaging results correlate very poorly with pain. In fact, we know that most people will have findings on imaging, even if they have no pain at all. A systematic review (see here) looked at imaging in people with no pain. 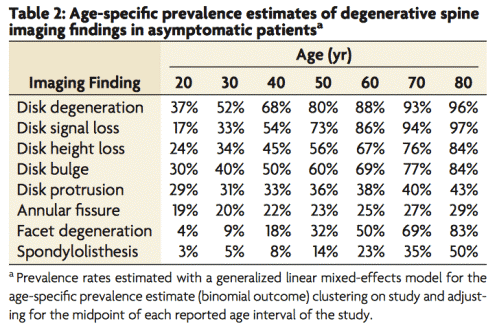 The results of this review showed just how common degenerative findings were in people that were pain free (see below table). This tells us, that degenerative changes are a normal part of the ageing process and are often asymptomatic (do not cause pain or other symptoms). Is your bulging disc causing your pain? Bulging discs are an extremely common finding in people who do not have pain. Even at 30, its common to have disc degeneration and by the time you reach 40, the majority of people actually have a bulging disc. Having a disc bulge or disc degeneration is not diagnostic of pain. Even if you are under 30 and have ‘disc degeneration’, it’s relatively common and not diagnostic of pain or function. To simplify, the pain you feel in your back or neck, might not be coming from your ‘slipped’ or ‘bulging’ disc! Essentially, you can think of a ‘bulging disc’ or ‘disc degeneration’ (both scary terms), as normal findings akin to having grey hairs or wrinkles – often painless indicators of ageing or life experiences. XRay, MRI and CT scans are incredibly important when used correctly, and medical imaging and technology has come a long way to give us this unique insight into the body. However, it is essential to correlate imaging results with clinical findings in each individual. We need to understand that for the back (and to a degree for other body parts), imaging doesn’t necessarily inform us of the cause of pain. Pain of any cause, and in particular pain that is persistent (chronic / long standing), is influenced by many things (sleep, stress, mood etc. ), not just tissue damage to the body’s structures (discs, joints, muscles, ligaments, etc). In fact, pain does not mean there is damage and is best thought of as more of an alarm that can in fact be triggered by things that are not harmful. Your Physio needs to be able to identify and understand these contributing factors for each individual and address them to restore function and relieve your pain. If you would like to learn more about pain, please watch this 5-minute video (here). The key take-home message is that degenerative changes on imaging results are NOT a reason to be fearful. Fear of your back can impact you in many ways including reducing the amount and way you move. This in turn can create or exacerbate pain. Instead you should see your Physio, get some good advice and education and most importantly move.